Tags: Bromeliaceae | Ananas comosus (L.) Merr. A big thank you to Ken McCown of California (aka ken mccown@flickr) for today’s image (original) submitted via the BPotD Flickr Group Pool. 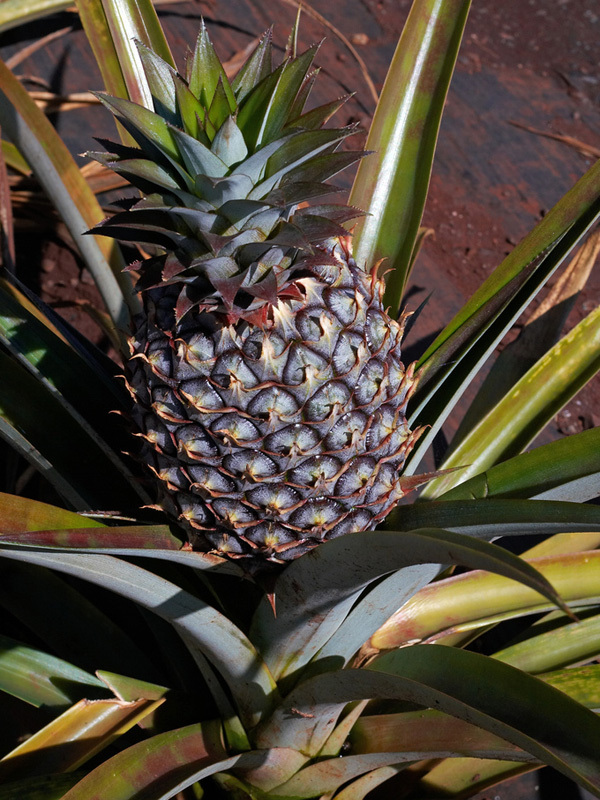 With hundreds of cultivars, it is impossible to identify which variety of pineapple this might be. Pineapples themselves can make identification difficult in other realms: “Workers who cut up pineapples have their fingerprints almost completely obliterated by pressure and the keratolytic effect of bromelain (calcium oxalate crystals and citric acid were excluded as the cause).” via Purdue University’s Center for New Crops and Plants Products entry on Ananas comosus. To see a photograph of a pineapple in flower, visit Cal’s Plant of the Week page on Ananas comosus from the University of Oklahoma. “Workers who cut up pineapples have their fingerprints almost completely obliterated by pressure and the keratolytic effect of bromelain (calcium oxalate crystals and citric acid were excluded as the cause).” If that isn’t the basis for a ‘whodunit’ I don’t know what is. Do the fingerprints grow back when the workers stay away from pineapples? I read a few years ago that fingerprint strength varies: women tend to have less clear prints than men, and bricklayers tend to have less clear prints than practically everyone else. So I guess a female bricklayer who loved pinapples would have been the perfect criminal back before DNA testing. A bit of a confusion here fingerprints are what traces a human finger leaves on most surfaces probably mostly denatured fats and somewhat fewer proteins. Fingerprints DOES NOT refer to the actual rete ridges of human skin. I doubt that bromolein dissolves human fingers skin and all. Though I wouldnt dip my hand into nitric or sulphuric acid.